We urge you immediately to impose a no-fly zone on Libya to stop aerial bombings, attacks and the movement of Qaddafi's troops and weapons, which are inflicting a terrible toll on civilians, and to protect the needs and interests of the Libyan people. As Libyan government jets drop bombs on the civilian population, the UN Security Council will decide in 48 hours whether to impose a no-fly zone to keep Qaddafi's warplanes on the ground. Two weeks ago Avaaz members sent 450,000 emails to the Security Council, reportedly stunning the President of the Council's office and getting a public response from the US ambassador. Then, we helped win serious targeted sanctions on the Libyan regime - now, to stop the bloodshed, we need a massive outcry for a no-fly zone. 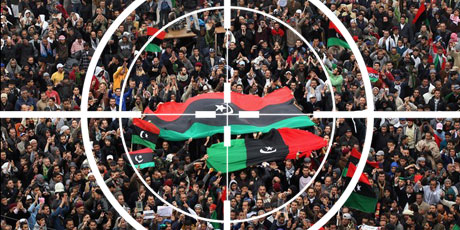 As long as Qaddafi's gunships are in the air, the civilian death toll will rise. Many European and Arab nations support a no-fly zone, but the politics of the Security Council requires unity to pass a resolution. A powerful public demand from all corners of the planet can push all the governments on the Council to take action. We have just 48 hours left -- sign now and forward this email widely.